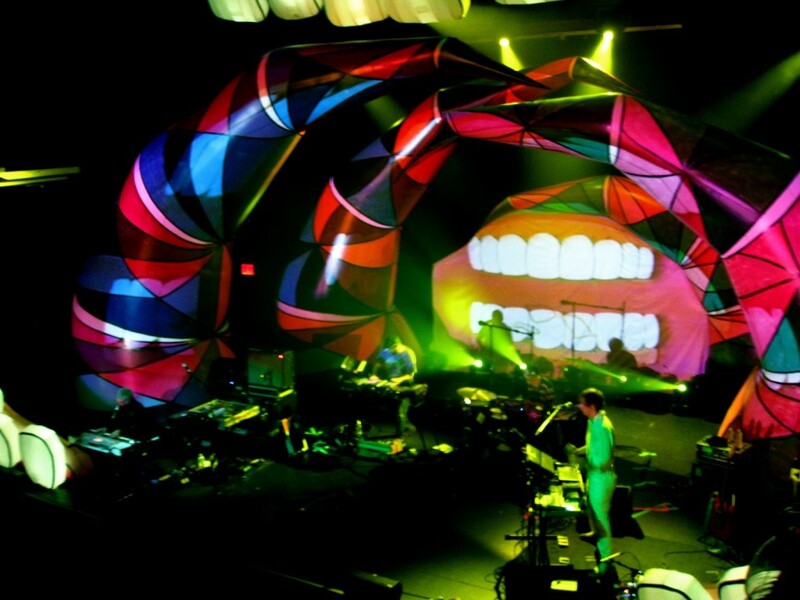 Ever the new music innovators, for their tour in 2012 Animal Collective has gone retro. Over the last decade the band has slowly evolved into a purely electronic live act. And when founder Deakin took a “leave”, the band was a trio for the last several years. But Deakin is back and so is a more traditional band layout on stage. At Terminal 5 earlier this month, Panda Bear spent the entire show playing a full drum set, Deakin was primarily on guitar and Avey Tare played keyboards. Surely, there were electronics — Geologist mostly, but each of the other three had their gizmos laid out in front of them. This year the band is touring on the strength of the new album Centipede Hz (Domino), a release that flew under the buzz radar but which is as solid as anything the band has ever produced. At Terminal 5 Animal Collective played two consecutive nights, a make-up of sorts for the Williamsburg Waterfront show postponed in August. AC seemed quite comfortable in the “new” config on the first night of the Terminal 5 shows, and played nearly two hours. The setlist began with almost all of Centipede before the classics to closed the show. Animal Collective will tour Australia after the New Year, and likely return to NYC for Spring or Summer shows. I recorded this show with the 4-mic configuration from inside of the soundboard booth on the floor. The large venue swallowed up some of the sound on this night, so that while the recording is rich in bottom end, its also a bit “boomy”. With that caveat, enjoy! This Recording is now available for Download in FLAC and MP3 and to Stream at Archive.org [HERE]. If you download this recording from NYCTaper, we expect that you will PLEASE SUPPORT Animal Collective, visit their website, and purchase Centipede Hz from the Domino Records Store [HERE]. Pulleys is amazing! Thanks. Wish you had the next night too.